Linux Tip #2 වලින් කියන්නේ හදන්නේ මොකද්ද කියලා මේ වෙද්දී දන්නවා ඇති. ඒ නිසා වැඩිය ඒ ගැන කියන්න යන්නේ නෑ. අපි වින්ඩොව්ස් වලදී නම් එක එක tools use කරනවනේ. microsoft එකෙනුත් tools දීලා තියනවා. ඒ windows වලදිනේ. මේ කියන්නේ linux වලදීත් ඒ වගේ ඒ විදියටම ( ඊට වැඩිය හොඳට 😀 කිව්වොත් හරි ). Linux වලදී මේ වැඩේ කරන්න අපිට tool එකක් install කරගන්න වෙනවා. ඒ තමයි vnstat. මේ තියන terminal command එකෙන් අරගන්න පුළුවන්. 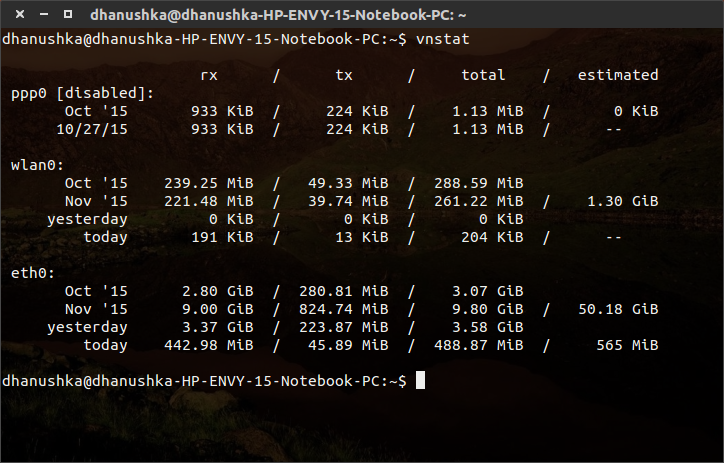 දැන් නිකන් terminal එකේ vnstat කියලා ගහලා බලන්න. usage වගයක් පෙන්නනවා නේද ?? 🙂 පැත්තෙන් බලාගන්න පුළුවන් දැනට active වෙලා තියන interfaces මොනවද කියලා. මගේ තියෙන්නේ eth0, wlan0 active ඒවා විදියට. මේ tool එක install කරපු වෙලාවේ ඉඳලා තමයි calculate වෙන්න පටන් ගන්නේ. දැන් බලමු features මොනවද කියලා. දවස ගානේ usage එක බලන්න පුළුවන්. live usage එක බලන්නේ මෙහෙමයි. monthly usage එක බලන්නේ මේ විදියට. මේ details එන්නේ select වෙලා තියන interface එකට අදාලව. default එකට අමතරව වෙන interface එකක details බලන්න interface එක මාරු කරන්න. මීට අමතරව -w වලින් weekly, -h වලින් hourly usage එක බලන්න පුළුවන්. This entry was posted in FOSS, Knowledge and tagged foss, how to, linux, linux-tip, ubuntu by dhanush_c. Bookmark the permalink. මන් නම් කරන්නේ conky එකට දාල තියෙන එක, එතනින් මට දැන් speed එක සහ connectivity එක දැනගන්ඩ පුළුවන්. මට පරණ දත්ත බලන්න ඕනේ වෙලා තිබුණේ නැහැ මීට කලින්. vnstat භාවිතා කරලා තිබුණේ නැ එක හින්ද. දැනගන්ඩ ලැබුන හොද application එකක්. මට නිකම් අදහසක් ආව දවසක් තුලදී භාවිතාව සීමාවක ට වැඩියෙන් ගියොත් එහෙම notification එහෙම දෙන්න උනත් පොඩි bash program එකක් ගහල හදාගන්න පුළුවන් නේ? හිතුනොත් පොඩ්ඩක් උත්සහ කරලා බලනවා වෙලාවක.